BARTOW – It’s still early to say which of the many Florida obstacle mud runs will survive beyond 2011, but we’re placing a bet on The Highlander Adventure Run which held its second event in 90 days this morning. We thought it was a little ambitious to return to the same venue so soon after a July 23 debut, but Jonny Simpkins and his crew showed why it’s worth a trip to a property that while off the beaten path even by mud run standards is worth the drive. Simpkins has a background in both endurance sports and motocross racing and is the owner of an irrigation company. Throw in a unique piece of property, a tract of several thousand acres with terrain of various elevations, and you have a good formula to stand out in an increasingly crowded race category. 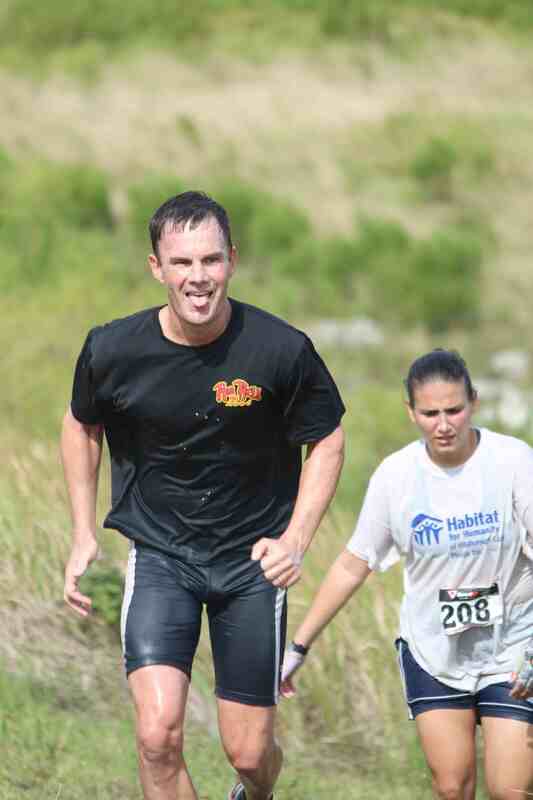 In July, we wrote that there were 22 obstacle mud runs being staged in Florida for 2011 by 17 different companies. We haven’t done an updated count, but it figures that list is now 30 runs by 20 outfits, with more to come in 2012. This year I’ve done Muddy Buddy, the Spartan Race, and Savage Race. Tough Mudder, coming to Dade City in December is on my schedule. Admittedly that’s not a huge sampling of races (especially since I did Spartan Race in Virginia), but it’s enough to know that mud runs follow a typical formula: two dozen obstacles or so over a 3-to-6 mile course, post-race music, limited free food, and (usually) beer, and challenges involving some combination of mud, fire, water, barbwire, and walls. I lost track of how many obstacles Highlander threw at me over the 3-mile course. I opted for the 3-miler over the 6-miler so I could catch my sons in the kids race (more on that in a moment). 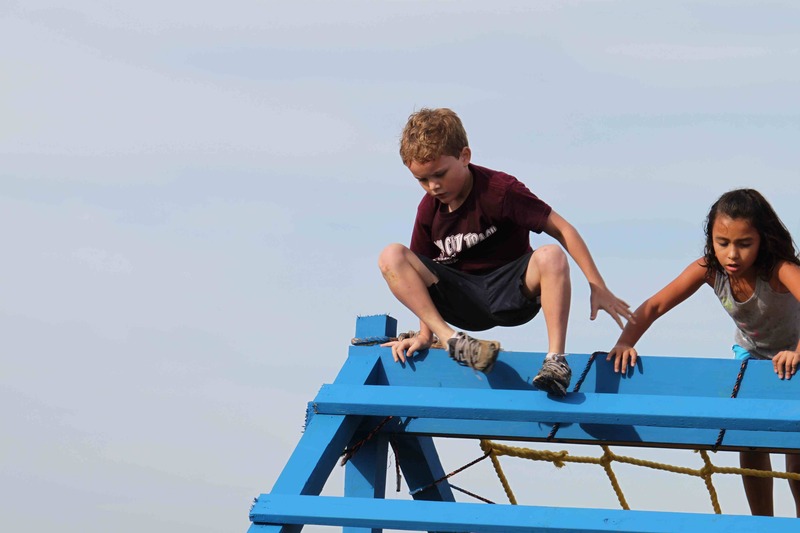 There were familiar obstacles such as crawling through mud under barbwire, monkey bars, climbing over wooden walls and ladder obstacles, and negotiating a balance beam and various tire configurations. Kids got their own race. More unusual challenges included a series of waist-deep rope maneuvers in a lake best attempted via full immersion (though not required). Pine plantations on the property provided a woodsy change of pace. The last 400 yards included rapid-fire challenges including a zipline, more waist-deep water obstacles, and a climb up the hill to Highlander’s signature finale: a plunge down a 150-foot water slide into muddy water. (I wouldn’t recommend going headfirst and the subsequent belly flop). The Highlander might have the best layout of any Florida endurance event I’ve attended. Registration, start/finish, and post-race events take place atop a raised area that enables spectators to look down and see more than 75 percent of the course. (This would be an ideal site for a Civil War reenactment if, of course, there had a been a battle anywhere nearby). A live band kicked into gear before the first wave got underway and a bagpipe player contributed to the Celtic theme of the event. The organizers managed to attract both a younger demographic and a family one with a bounce house and a free kids race. It’s tough to find a free kids race these days, let alone a significant one. We figured the kids were going to just get a shot at going down the slide, which would have been fine. (Heck, Muddy Buddy charges just for kids to go through a mudpit.) Instead, the Highlander kids got a half-mile course featuring a half dozen obstacles built just for their race – and the slide. There were no T-shirts or medals for the kids and, when you think about it, isn’t that how it should be? What parent wouldn’t jump at that tradeoff for a free race? My guys had no complaints, just rave reviews. Today’s Highlander shirt was a sharp cranberry-colored Tultex. Hopefully this trend continues. We’re tired of tech shirts that make you feel like you’re wearing a baggy shower curtain, especially when they’re splashed with two dozen sponsor logos on the back. (Not naming names, but an organization with the initials WTC is the biggest offender of this.) Give me a form-fitting Tultex that’s as comfortable as a pajama top and I’m good. Speaking of WTC, the parent company of Ironman, it quietly canceled plans to launch its own Primal Challenge mud run series. Nothing against Muddy Buddy, Spartan Race, Tough Mudder, Warrior Dash and the other national races – we’ve done most of them and enjoyed them all – but we can’t help but wonder if races put on by Florida-based promoters to smaller, more manageable crowds might be the trend for 2012. If they’re more like the Highlander, we’ll be all for it.